Looking back at the recently finished year one can find few common links for the markets in the region, as they were all affected by circumstances unique for their surroundings. However, as one can see from the table below, the one thing that all markets had in common were declining turnovers. 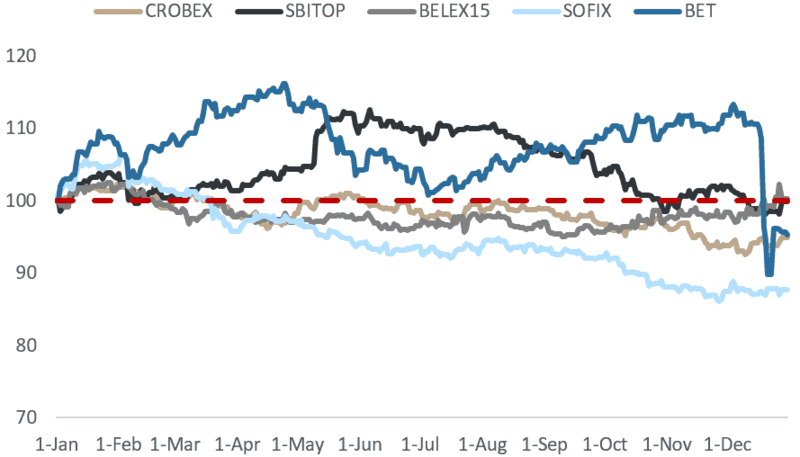 Turning our attention to the yearly performance of regional indices, one can notice that only the Slovenian SBITOP and the Serbian BELEX15 ended 2018 flat, while the rest fell below their initial value. The BET index’s eye-catching downward performance certainly stands out here as the Romanian market was hit hard by the introduction of new tax burdens on some of the country’s most important industries. Below we bring you a more detailed overview of key events which shaped regional markets in 2018. The Croatian market witnessed a significant decrease in liquidity in 2018 with the market’s average daily turnover sliced by one third when compared to 2017, amounting to EUR 1.15m. The decrease in turnover went hand in hand with the overall lower market performance as CROBEX decreased by 5.1% since the beginning of the year. 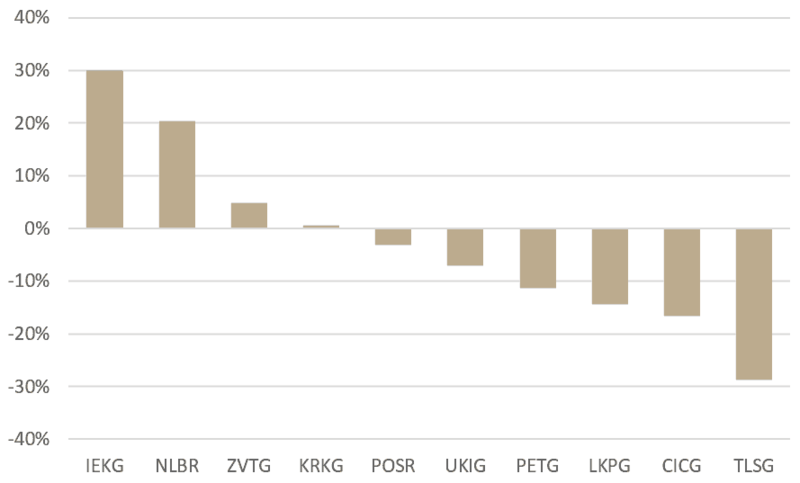 When looking at the performance of individual Croatian companies, one can certainly say that their performance was determined by how well they managed to bounce back from the 2017 selloff caused by the Agrokor crisis. As a result, the biggest gainers in the Croatian market were Atlantic Grupa and Podravka, whose share prices increased by 35% and 39%, respectively. Other than Agrokor’s direct suppliers, in 2018 we also witnessed the recovery of Croatian banks whose results were finally relieved of the heavy provisions recorded in the previous year. Also note that after numerous months of negotiations Agrokor’s creditors put the proposed settlement to a vote in July 2018, which ended with a clear majority approval of 80.2% in favour. The next step in the process was the confirmation of the settlement by the High Commercial Court in Zagreb which came on October 26th, whereby the settlement became effective. Meanwhile, the tourism sector came under a lot scrutiny as many investors expected the sector to go bust, collapsing under the pressure of reinvigorated competition in the Mediterranean. However, these expectations turned out to be false as Croatia recorded yet another year with more arrivals and overnight stays. Among tourist shares one should highlight Valamar whose share, despite strong results, ended the year 16% below its starting value. 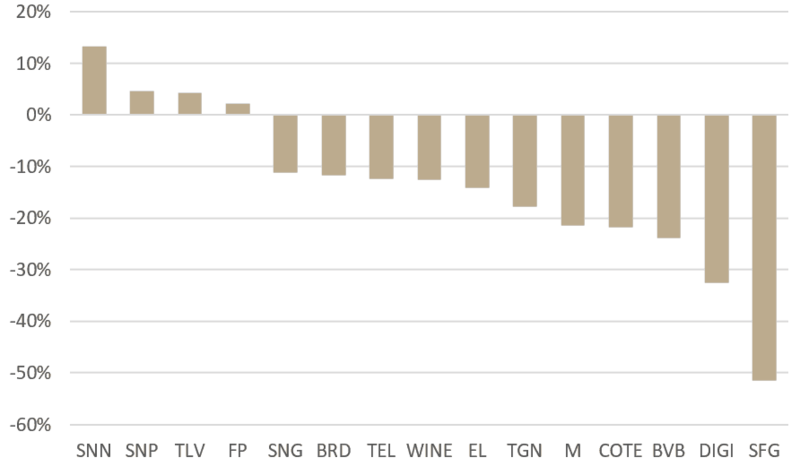 Note that the share experienced a selloff at one point during the year as Valamar was cut from the MSCI Frontier market index, but also following the share development of foreign peers. 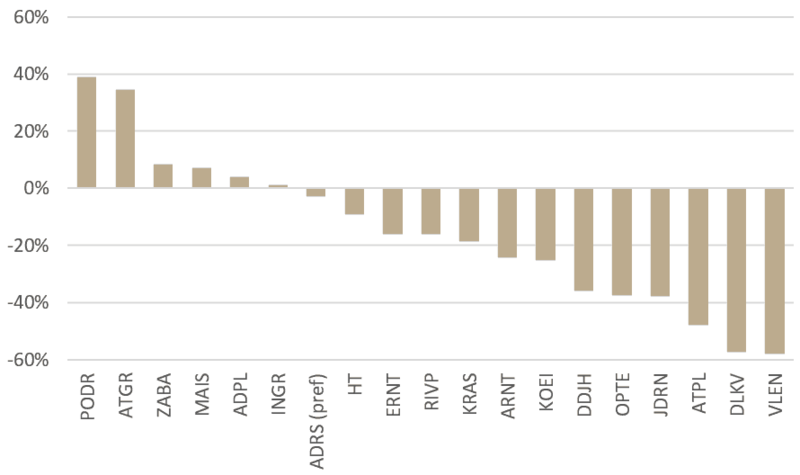 This triggered some investors who use passive investment strategies to exit their positions, dragging the price down to HRK 32 (-27% since the begging of the year). Deals-wise, Croatia witnessed several transactions spread across several sectors which included both domestic and foreign acquisitions concluded by major Croatian companies. Certainly, the biggest deal concluded in Croatia last year was Adris’s takeover of HUP Zagreb. With it, Adris plans to lessen the seasonality effect of their tourist segment by adding city hotels into their offer. The takeover price amounted to HRK 3,969.16 per share, which at the time translated to an 11.2x EV/EBITDA and 18.3x P/E (based on end-2017 results). The price gave investors a premium of roughly 9%. Other notable acquisitions included AD Plastik’s purchase of a non-listed Hungarian company Tisza Automotive and Valamar’s purchase of Hoteli Makarska and the Petersbühel hotel in Austria. On the flip side, Atlantic continued their divestment of non-core assets by selling their entire stake in the Neva company. Finally, 2018 also gave the Croatian market a new member as the tourism company Jadran successfully concluded their IPO. However, note that the company struggles to record any notable liquidity of their share. When viewing the Slovenian market from afar one might describe it as flat, considering that the average daily turnover amounted to EUR 1.34m (-2% YoY), while the major index ended virtually unchanged. However, the Slovenian market witnessed several important acquisitions coupled with the long-awaited IPO of the NLB Bank. After searching for a strategic partner for several years, Gorenje announced a takeover offer by the Chinese company Hisense this year. The offer amounted to EUR 12 per share and represented double the market price, at the time. After the acceptance of the offer, Gorenje’s new majority shareholder approved the delisting of the company in September, along with the squeezeout. When looking at the performance of individual companies, Krka remains the most traded company in Slovenia with an average daily turnover of EUR 0.31m. Second comes Cinkarna Celje whose average daily turnover doubled to roughly EUR 0.2m as a result of the failed takeover attempt coupled with strong results in 2017 which provided their investors with a lucrative dividend. However, as the market conditions changed, and the company’s result deteriorated so did the share price which eventually ended 17% below its starting share price at the begging of the year. KD Group was the year’s biggest gainer among the SBITOP components as the company’s share price went up six times due to the successful sale of Adriatic Slovenia, Slovenia’s third biggest insurer. The total amount received by KD Group for the sale amounts to EUR 245m. 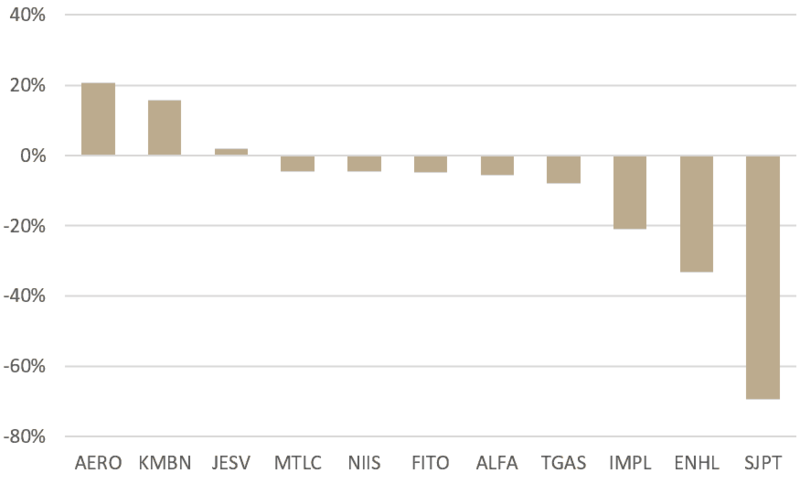 On the flip side, the biggest laggard was Telekom Slovenije whose share price decreased by 29% since the begging of 2018. By far the largest news on the Slovenian market in the previous year was the listing of the NLB Bank. After receiving pressure from the European Commission, the Slovenian Government finally decided to offer 75% minus one share to the public. In the end, 59% of the total shares were sold at EUR 51.50 (a total of EUR 609m), the bottom of the range communicated within the Prospectus. 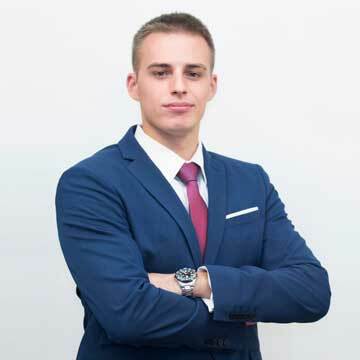 However, one should add that there was some bitterness among local investors as only 8.5% of shares were sold in the form of Ljubljana-listed shares, while the remaining 50.6% went to GDRs. Following the IPO, one could say that NLB’s share posted a stellar performance as the share price ended the year up 20%. The Romanian market outperformed the region during the entire year, however the recent shock came when the Romanian Government decided to introduce a tax on banking assets along with other tax burdens on energy companies which threaten to heavily diminish the banks’ and the companies’ profits. According to the new regulation banks will have to pay a tax on their financial assets ranging between 0.1% and 0.5%, depending on the value of the quarterly average of ROBOR 3M and ROBOR 6M. Meanwhile, energy companies are faced with a gas price capping at RON 68/MWh and a 2% tax on turnover. Telcom companies were hurt by the new legislation as well, with the Government imposing a 3% turnover tax on them. A large selloff followed shortly after the announcement of the new tax and the major index plummeted, ending the year 5% below its starting value. Meanwhile, the average daily turnover amounted to EUR 9.88m, down 5% when compared to 2017. Note that before the introduction of new taxes, BET was up 8% since the beginning of the year. However, things aren’t completely bleak. Since Romanian companies have been paying out high dividend, which at times gave their investors double digit yields, the total return of the BET index in 2018 amounts to 4% making it still the best performing index in the region. In other markets one should mention that the French concessionaire VINCI successfully took over the Belgrade airport in December. As a reminder, VINCI was granted a 25-year concession during which the company will both manage and develop the Belgrade airport. The total value of the concession amounts to EUR 1.2bn and consists out of a one-time payment of EUR 501m, yearly payments between EUR 4.3m and EUR 16m and an investment worth EUR 732m into the airport’s facilities. Where is the Bottom for Peripheral Spreads?